I used Creamy Caramel for the base and the DP is "Bohemia Christmas" by Basic Grey which I've had for two years now and use it sparingly because I love it so! The mats areound the DP are Close To Cocoa and Bordering Blue. 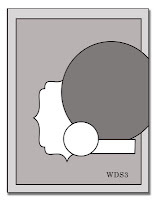 The edge of the circle is sponged with Close To Cocoa ink. 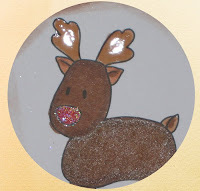 I used Glossy Accents on the ears and hooves for some shine, the body of Rudolf is sporting Tan coloured Fun Flock and the nose is coloured with Real Red SU marker and then covered with Glamour Dust. Here's a close up for you to see. 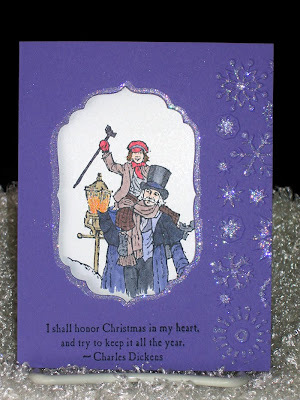 I added the sentiment from Short & Sweet by SU and encased it in a metal oval from Hodge Podge hardware, also by SU. The ribbon is just a bit from my ever-increasing stash. My poor James has the chicken pox! My daughter sent me an e-mail yesterday telling me that my grandson, James, has the chicken pox! I felt so bad because he's only 16 months old and can't figure out why he's all itchy and out-of-sorts. 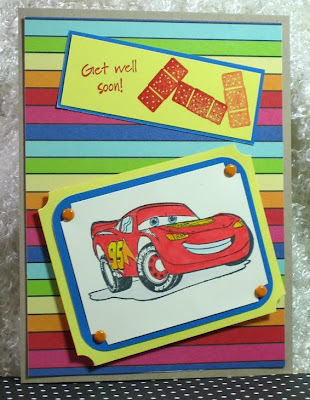 I hope this card makes him feel a little better. We love you, James, and hope you are better soon. Please, don't give them to your big brother, Owen. Mommy and Daddy will go nuts! The stamp is called "sumpin's wrong" from Mo's Digital Pencil. She has some really cute stamps and this one was perfect for the occasion. 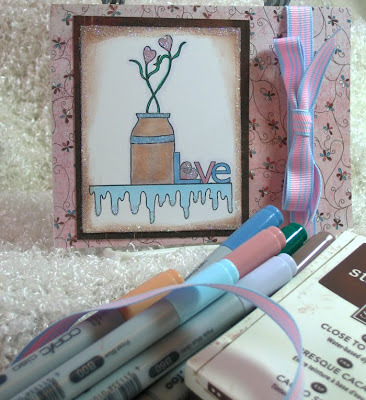 Last week I participated in a sketch challenge at Whimsie Doodles which you can see here. This morning I turn on my computer, as I do every morning while waiting for my coffee to brew, and there was my name in the Whimsie Doodles newsletter. Thank you so much, Whimsie Doodles. 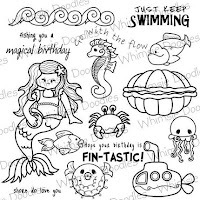 Hop on over to Whimsie Doodles store and check them out. This is the set I chose. 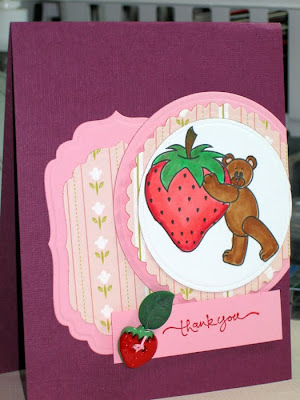 I loved the card made by Thanh Vo of Yummy Creations, so just had to have this set. I may be slower than some, but I get there in the end. The images from There's Magic In The Air are so cute/lovely that I couldn't resist playing in today's challenge. In order to make this "sparkle" I sprinkled some Glamour Dust on the hearts, both flower and word, a little bit on the jug and some on the tips of the icicles and then completed the look by framing the entire image. Copic markers were used to colour the image and and little ribbon on the side for dimension. The patterned paper is from Basic Grey's "Archive" collection which I've had stashed away for quite a while now and I love it. I had every intention of participating in last week's challenge, but just didn't find the time last week. Here it is anyway, and congratulations to the winner of this challenge, JanJ. Lucky you, Jan! This little fellow is Eldon and he's adorable. I just had to make a card with him. 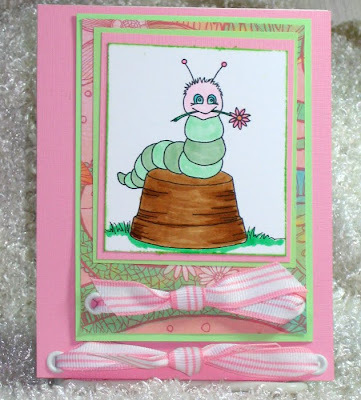 The card base is Pretty In Pink with some Gable Green mats. The DP is Klaidescope by SU and the ribbon is Pretty In Pink. Of course, I used my Copics to colour Eldon. What fun and I can't wait to see next week's challenge at There's Magic In The Air! This card meets the requirements for two challenges. The first is Get Sketchy Challenge # 7. Great sketch and I loved doing it. Here is the sketch from Get Sketchy. The second challenge is one from The Stamp Shack. We were asked to create a card that uses "matstacks". Over the years, I have collected umpteen dozen of these pads and really don't use them often enough. I guess I need to be told specifically when to use them. 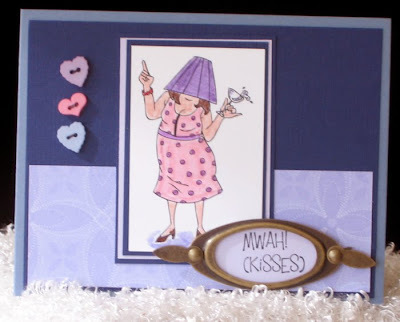 I chose the Hooga Booga stamps by MFT. I used Flower Soft for the dress and, as you can see from the photo, the paper is Pocketful of Posies by DCWV. The image was stamped in Memento Tuxedo Black and the arms and bow were coloured with Copic markers. I added a few buttons and did some sewing, too. That's it for today. Haven't posted for a while and then can't seem to stop. Sorry. 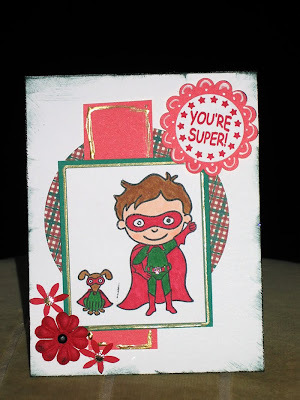 Card for a little fellow who broke his elbow! Can you say "OUCH". It must be very painful. One of our Shackie's told us about her great-nephew who is only five and going through some painful surgeries because of a broken elbow. 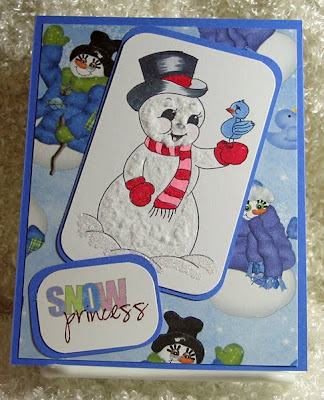 I took out some scraps and put together this card. 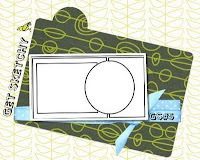 Outside of the card base being made of SU craft c/s, I don't remember the other papers, patterned or otherwise. The stamp set is by All Night Media and I got a terrific deal on the set from another Shackie. Thanks, Erin, I finally got to use it. What I like about digital images is the fact you can re-size them and, as in this case, I flipped it horizontally. 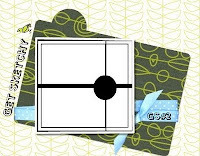 I thought he would look better marching into the middle of the card, rather than off the card. It's the 'designer's' choice. 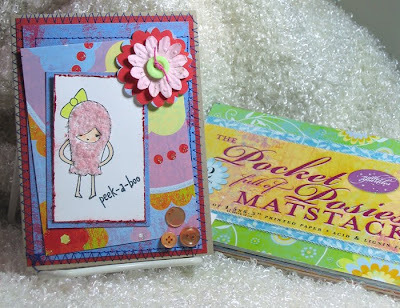 I used Razzleberry for the base, Pretty In Pink as the accent and a Cottage Tulips by Chatterbox for the DP. The sentiment is from Short & Sweet by SU. Most the family were here yesterday for Andrew's birthday. The youngest guest was Ava who is 10 months old. Her dad, Phil, has taught her to open her mouth on command which is a very useful thing when we all know kids put everything into their mouths. Here's a little video of Ava responding to her Dad. 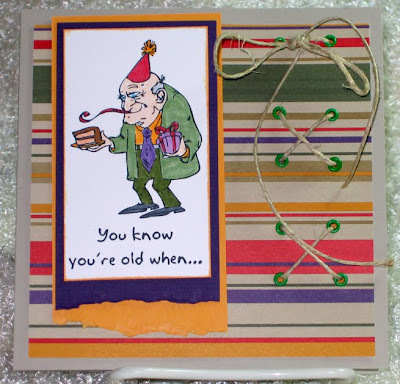 Last night I picked up a couple of freebie digital images from Little Paper Shop and today, I made a card. 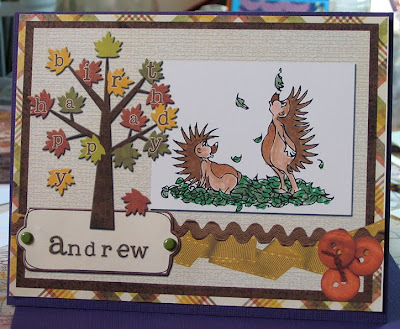 This card is entirely digital, expect for the two brads on the nameplate and I coloured the 'hedgies' image with Copic markers. 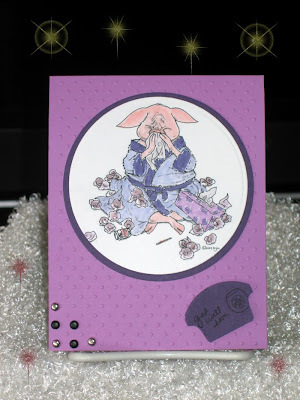 The cardstock (not digital, of course) is Elegant Eggplant by SU, but the patterned papers and the elements and the alphas are all from the kit "Autumn Afternoon" by Bella Gypsy from Elemental Scraps. 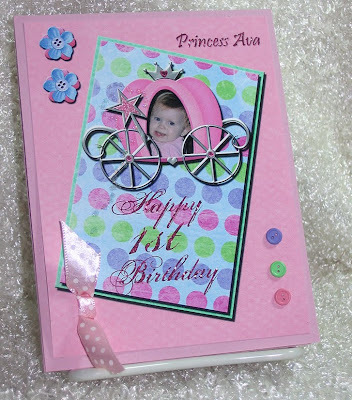 I love, love, love the "no-mess" way of making cards and/or scrapbook pages using only my computer. 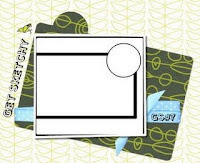 And for cards, it just doesn't get any easier for mailing because there's usually nothing to snap the postal machines, etc. Anyway, enough about my love of didital stuff, here's my card. If you are interested in digital, join some forums. 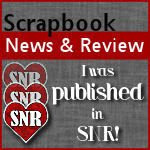 My most recent is becoming a member of the Little Paper Shop Social Network. Go take a look, you may enjoy yourself. Well, it's been a while since I posted, but it's been very hectic here; plus, my internet connection has been playing up and it's been very sporadic, indeed. 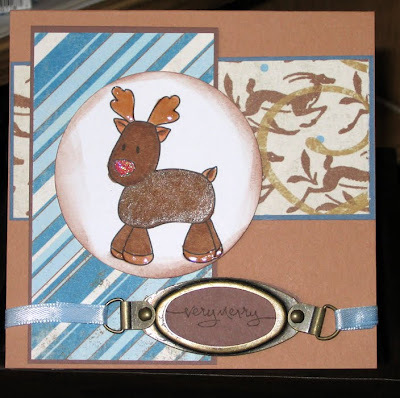 The stamp set is Unfrogettable by SU, the DP is Tangerine Plaid by Chater Box, the cardstock is Mellow Moss by SU. 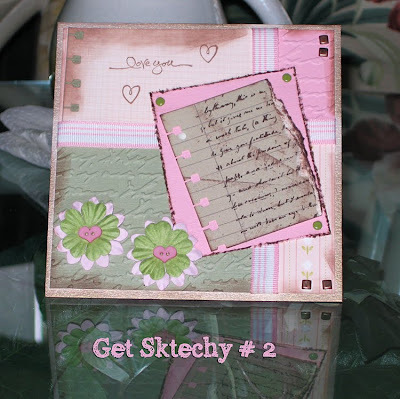 The next card uses a "freebie" digital image by Tim of Hambo Stamps. It was created entirely using digital products. It was made for a Shackie friend whose son loves receiving mail. I hope he enjoys the card. 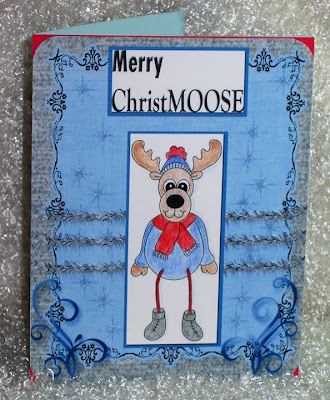 I'm really, really sorry, but, for the life of me, I cannot find the digital papers and elements I used to create this card. I do know they were all from the same kit and, if anyone recognizes these items, please let me know and I'll edit this post so that proper credit can be given. This has been such a busy week and I'm just now getting around to posting my entry for the Get Sketchy # 2 challenge. This is going to be short so I can get it posted. Here's the sketch we were to follow, using punches for the bonus. 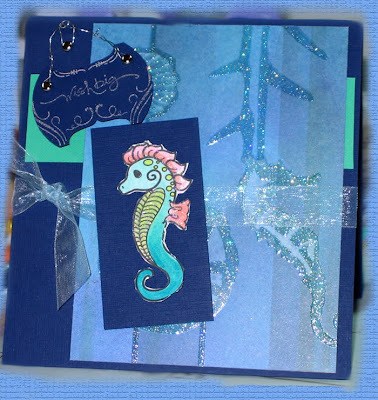 The base is a metallic c/s by Worldwin Papers. It has a lovely texture to it, but I don't remember where I got it. Too bad 'cause I'd like to get more! I used two SU c/s bits in Pretty In Pink and Mellow Moss. Both pieces were put through my CB using the Script folder. 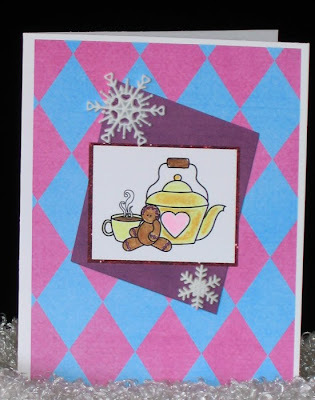 The DP is by Chatterbox and is called Cottage Tulips which can be seen in the lower right quadrant of the card. The stamped image is by Inkadinkado, stamp name unknown and not printed on the wood mount. I matter that onto Pretty In Pink and edged with Chocolate Chip ink. 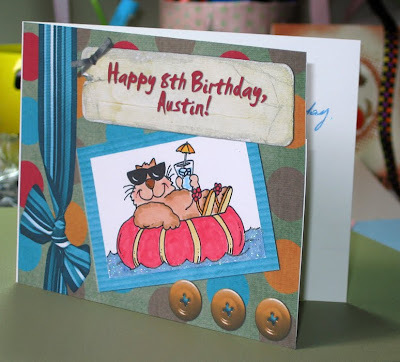 The stamped piece and the upper-left pink paper have been punched with the SU Sprial punch (love that punch). I added some PIP ribbon, brads and flowers with heart buttons in the centre and called it done! Now I'm off to Get Sketchy to add by name to there Mr. Linky List.